Philippines – The 2016 national election is nearing and the candidates are starting to reveal on what position that they are running. The latest to announce their candidacy are Senator Grace Poe and Senator Chiz Escudero. The two are known as good friends and will continue their friendship as tandem for the 2016 Elections. After several months of waiting Senator Grace Poe, the adopted son of Actor Fernando Poe Jr and Actress Susan Roces, finally declared her candidacy to run for a higher position as a Presidential Candidate, teaming with Senator Chiz Escudero, who also announce his candidacy as Senator Grace Poe, running mate for Vice President. Grace Poe, who early this year, declined the offer of VP Binay to be his running mate and after months of speculations that she will be the running mate of Mar Roxas, as vice president. She remain silence of her future candidacy but all was revealed after announcing her true prospect for the 2016 elections where she revealed in UP. Vice President Jejomar Binay, also one of the prime candidate for Presidency and a top contender for Presidency are still looking for a running mate for VP. As of now there are speculation that Senator Bong Bong Marcos is one who considered as his running mate. Davao City, Mayor Rodrigo Duterte, who once announce that he will run for Presidency announce that he will no longer run for Presidency and Quote that he has no ambition to become a President. 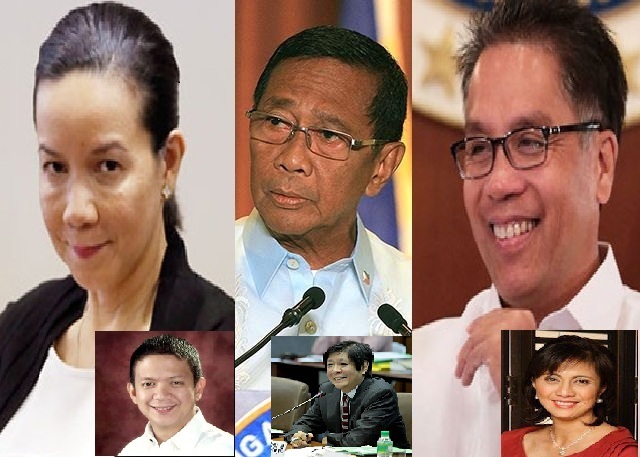 While former DILG secretary and administration bid Mar Roxas, is also considered to be a top contender for Presidency, was decline by Senator Grace Poe to be a running mate, however Roxas accept the decision of Grace Poe, and now moving towards in searching for the right running mate. On the list of candidate for VP for Roxas, are names like Governor Vilma Santos and The wife of late DILG Secretary Leni Robredo. As of now this are the list of Presidential and Vice presidential candidates that already proclaimed their candidacy. It is expected that the list will increase as the 2016 Elections is nearing. 1 comment to ''Who’s In And Who’s Out For The 2016 Presidential And Vice Presidential Elections"
duterte or bongbong marcos for president..